Currently I have 8 cats. Love the rascals. Also, 4 dogs, a ferret, a rabbit, and chickens. Whew! This is a lot of pets. Between my daughter's two dogs and our two, there are four in our house now that my daughter and her family moved in with us. They all get along and are well behaved. Lucy, our little Rat Terrier, is the leader of the pack and she is also the smallest at 18 lbs. Rat Terriers are pretty cute. Look like they would have a ton of energy as well. Also what I've read on them they seem to be very smart dogs. What breeds are the other three you have? Cooke, Shadow, and Molly are mixed. With that, I'm not sure. Been told several things with the last being part chihuahua and part pekinese. Roxy is my blood hound. Big goofy girl. Oh and I forgot to mention a 5th addition to my dog's. Molly's pup. Just a week old. Happened to have opened her eyes today. My ferret is Booboo. Amazing animal. Surprisingly incredibly smart. My cats are Fluffenstein, Patch, B.A., Garlic, Tange, Blacky, Crazy, and Fluff E'nuff. American Tabbies. They range in personalities. From Fluffenstein's laid back attitude to B.A. being incredibly unpredictable. I have an assortment of chickens. Road Island Reds, Game, Leghorns, even used to have Silkies. The kind that grows fur instead of feathers. The rabbit is named Snowball. Not completely sure on the breed. Lucy our Rat Terrier is smart. Currently she is the only dog we have with papers. She is completely wired all the time, proving the theory that you can't get fat if you stay in motion. Unfortunately, she also barks at everything which gets really annoying sometimes particularly when she incites the other dogs to bark too. Then it sounds like a kennel here. Her 80 lb. companion for the last seven years is Danny. Danny a rescue dog is a mix between an Irish Wolfhound and a black Labrador. He's very scary looking and he is also the mellowest dog you could ever meet. The new arrivals, (been here since late January) are Mattie and Cooper. Mattie is a Border Collie rescue puppy. She's pretty bright and a lot calmer than Lucy. Cooper is the baby. He is only a year old. He is your basic mutt and also a rescue dog. He has curly hair and an elongated body. He's shy and sweet. One reason we no longer have a cat is because I am allergic to them. When I found this out we had a cat we really loved, so I got allergy shots once a week to fend off the symptoms. We'd had cats before too. For some reason, our cats acted more like dogs than cats, with the exception of them being more independent. My parents always had at least two and sometime more dogs all the while I was growing up. We also had a small one acre weekend farm, which we stocked with chickens, ducks, turkeys, rabbits, Guinea pigs, goats, sheep, a couple of horses and two pigs, which my parents had butchered when the neighbors complained. My mom was afraid of cats. She insisted that in a past life she was a Mayan Indian and was killed by a large cat....yeah, she was a little different. Wow!! His eye's were so amazing! Such a beautiful and primal look. 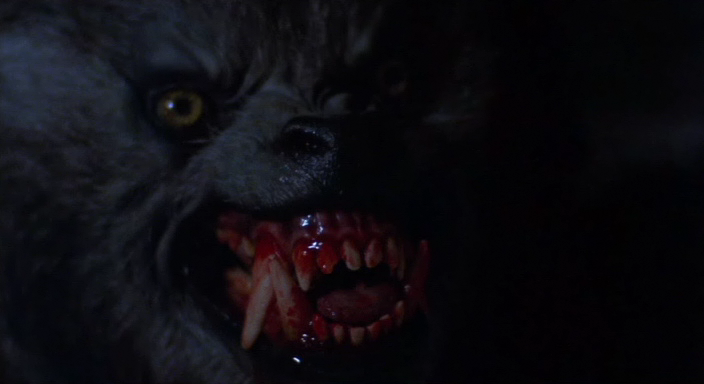 Kinda reminds me of the werewolf from An American Werewolf In London. But, man, I feel for ya. I remember when I lost my poodle. I literally had dreams of him not being dead and was just lost and found his way home again. Still remember all the things he would do. Whoa! A lab/Irish wolfhound mix. That sounds interesting. I had a lab/pit bull mix. Big baby to humans. Wasn't so nice to anything else besides his immediate pack. I remember he would chase after birds he saw in the air. One time while running full speed after one flying, he crashed into the side of my sister's truck. No negative reaction from him at all. Immediately got right back up and continued the chase. He was at 100 pounds. Big guy. Not as big as a bull mastiff I had. 6 months old and was hitting over 100 pounds. Sounds like you have a pretty good pack there. I bet it feels amazing just arriving home and having them all excited to see you. I live on a farm and have had just about every animal you've mentioned there. I live out in the sticks. So, no real neighbors to complain about anything. Plus I get to see all the wild life. Coyotes are common around here. Haha! Yes, sounds like she was a believer in reincarnation. I've heard many stories about people remembering past life events. My mom was a believer herself after reading a bunch of Sylvia Browne books. Gorgeous! My parent's own a dog that looks like'em. whats with the flamingo with only one foot? she[dog] used to like to tear stuffed animals apart, tore off the flamingoes foot and buried it somewhere, 2-3 years ago. Potato doesn't look like she appreciates being dressed up like a hoodrat pumpkin. whitefang during the last snow of the season 4-1-2015. Trying to find new place that allows dogs, want a pug!! !